The country called Nigeria has failed from the day-one of her creation by the diseased colonial master Lord Luggard and his girlfriend, Flora Shaw who together named the country Nigeria. The creation of this country is a crime against humanity because it comprises of three different ethnic groups forced to live together under one umbrella with only hate and envy for each other. While I do not like the mischievous Luggard's amalgamation of 1914, which alone is not responsible for Nigeria’s problem because Nigeria wasn't never meant to be. It's wasn't supposed to work, even Britain knew this and they still went ahead with the creation knowing full well it was only going to lead to endless bloodshed and suffering. Nigeria also is in trouble owing to massive corruption and misgovernance which cross across ethnic lines. What the world does not seem to realize is that Nigeria is already a failed state. Since 1960 of her independent, Nigeria has been experiencing incessant religious and ethical war which led to the first Biafra civil war that took millions of lives. President Muhammadu Buhari is already planning a second genocide by mass assassination of Biafrans since he became president. Over 4000 Biafrans have been murdered by the Nigeria Armed Forces in less than 2years into Buhari's administration. Even today in Nigeria, despite many years of the so-called democratic government during which it has lost roughly $300 billion dollars to corruption, the roads in Nigeria are worse than war-torn countries, no water supply in Nigeria, a collapsing electric grid and pathetically equipped and funded schools and hospitals everywhere in Nigeria. Consequently, Nigeria has legions of jobless and poorly educated urban youths scrambling for a living in cities that resemble primeval hell holes. It's not that Niger Delta Avengers (Freedom Fighters) are battling for an effectively weak state, but they are fighting because they know that nothing good will ever come out from Nigeria, that's why they demand for freedom. These problems happens when incompetent leaders are in the sit of leadership, Islamic brother-hood forcefully implementing shariah laws to people that know nothing about Islam and there is no longer freedom of worship as long as you are a Christian, you must fear for your life. 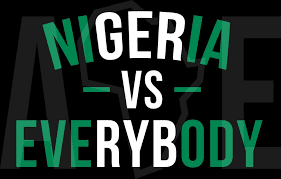 Some analysts have predicted the break-up of Nigeria in 2015. Notably, the formal U.S Commissioner to Nigeria, John Campbell gave an in-depth analysis of how Nigeria is tottering towards a failed state due to inherent corruption, ethno-Religious tension, increase in Islamic radicalism, power tussles by elites and the tension of the 2015 presidential election. This prediction is quite real because the fraudulent present administration lead by President Muhammadu Buhari is fueling the fall of Nigeria. Since President Muhammadu Buhari was elected as the president of Nigeria, the country have been facing economical recession that is now leading to selling of national assets ", John Campbell's predictions proved that if a dictator and a Hitler is elected as the president, that would be the beginning of the country's doom and here we are. Now, it's clear to the whole world that Nigeria is already a failed country, so the best thing now is to divide Nigeria. Nigerian government should give boko haram terrorists the Islamic state they are fighting and killing innocent souls for, and as well let Biafrans go because they are not Nigerians but were forcefully amalgamated with Nigerians by Lord Luggard.